Address fields are different than all other fields in Quick Base: they contain subfields. Rather than adding several separate fields into tables that track addresses, you can add just one Address field, which tracks all of that data. 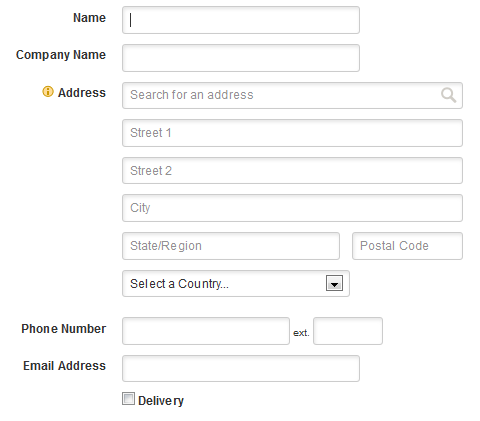 When you first view an Address field in a form, you’ll note that while there’s only one field title, there are several subfields to fill in. After you've entered the address, the address appears with a map showing its location. Clicking on the address opens the map in another browser tab. On mobile devices, the address will not appear as a link, but selecting opens your device's map app (in iOS and Android) or a map in your device's browser. 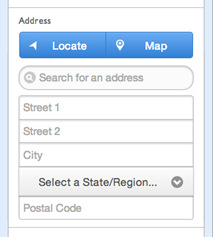 In addition, two buttons are available in the mobile version to make using Address fields even easier. The Locate button works with GPS-enabled devices to enter your current location as the address. The Map button displays the address on a map.